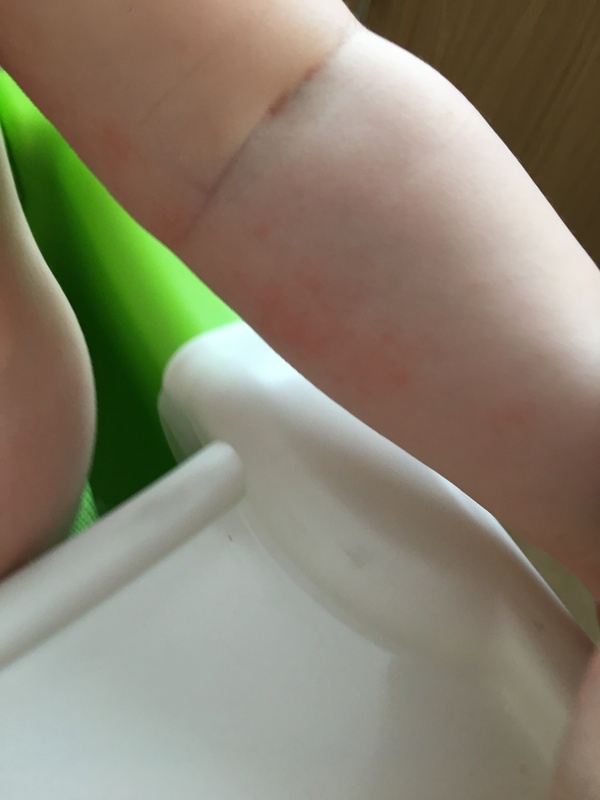 I’ve posted about Miss Cs food allergies before and a few of them snuck up and gave us a surprise. When I started weaning her brother I was particularly vigilant to make sure there were no reactions. All allergies react differently, it could be a rash, hives, vomiting, gas, the trots and some cases even anaphylaxis. When I was weaning I would give the same food at least 2 days in a row to see if there was any reaction. The first food that caused a reaction was lentils. I had made a lentil and vegetable puree and after he ate it he had a rash around his mouth which looked a bit like prickly heat. I gave him more the next day and he instantly got the rash again. 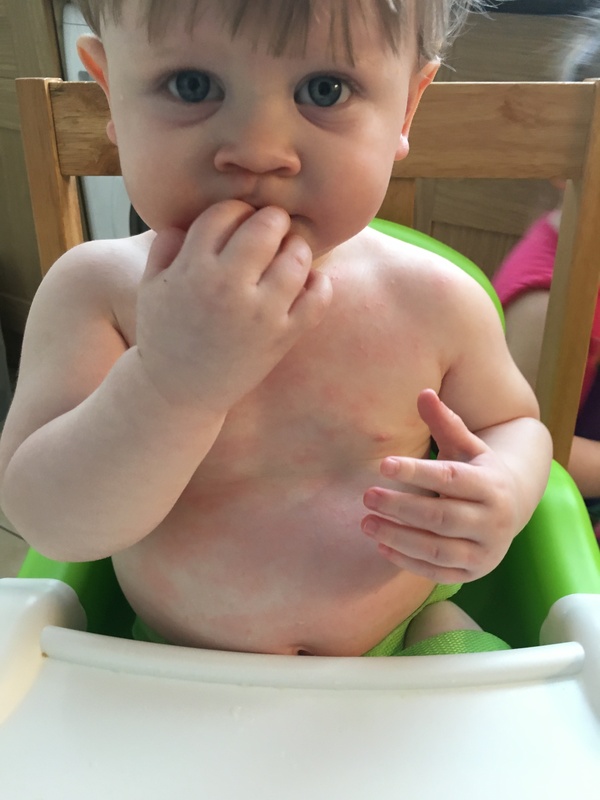 A few weeks later I had made his sister some dairy free scrambled egg made with almond milk and within 5 minutes he was refusing to eat, his skin was all red and blotchy and he was scratching like crazy. I stopped giving him the egg and watched him for 5 mins to see if that was the only reaction. He seemed to be getting itchier and all of a sudden his breathing seemed laboured. I decided to give him some antihistamine and phoned Mr B who was working locally just incase I had to take him to the hospital. 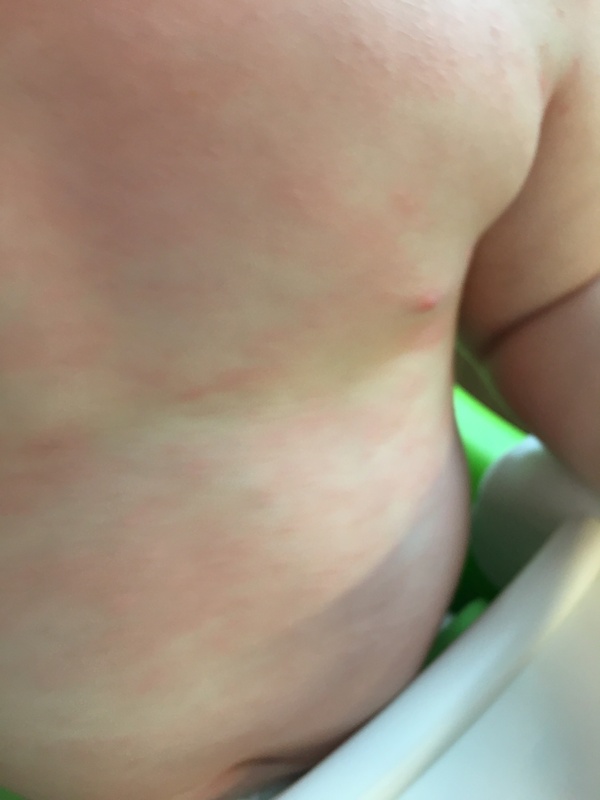 As soon as I gave him the Piriton he was sick but thankfully it seemed to do it’s job and his breathing went back to normal after 10 mins and the rash started to fade. I wasn’t sure what it was that he had reacted to, it could have been the eggs or the almond milk and I knew from experience that I would have to give him eggs again without the almond milk to rule it out. I left it a few weeks and gave him scrambled egg with cows milk and he had the same reaction. I treated it with Piriton again and he was fine. We have been avoiding egg and to be honest, we haven’t really had that much of an issue. Most of his food is made from scratch by me and if I do need to buy anything then I just need to check the ingredients. Yesterday I made his sister scrambled egg for lunch and as always, I made sure that everything I used was kept away from his plate and utensils. All was well, she ate her egg, he ate his sandwich and his peach. Miss C decided to help her brother and gave him a few bits then started dancing round about him. 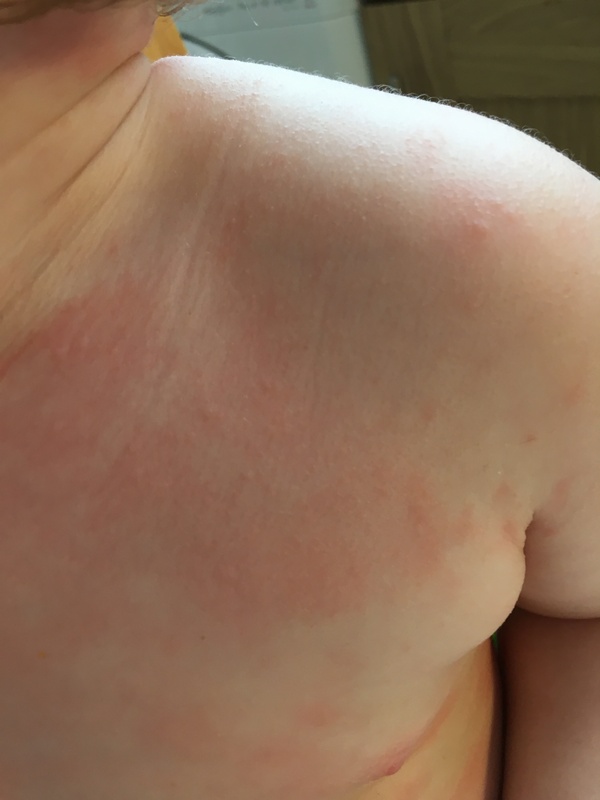 I was clearing up when I noticed he was scratching his chest so I went to have a look and saw that he was red and covered in hives. I couldn’t figure out what had happened then realised that Miss C must have had remnants of egg on her hands when she touched the fruit. Again, within a few minutes his breathing started to become laboured and he was clawing at himself. I gave him some Piriton and cleared everything away and cleaned his chair and tray just incase there was anymore there. When you are dealing with your kids allergies you usually know what to look out for and what kind of reaction to expect. Certainly with Miss C we know what happens when she reacts to different foods but we have never had any kind of reaction like this. I need to make sure I always have a bottle of Piriton in my bag at all times and I am going to speak to the allergy specialist who we are going to see on Friday for Miss C and enquire if we can get him tested to make sure we are managing his needs properly.